I'm no stranger to the jello shot; let's just say I've licked more than one of those annoying little plastic containers clean. So when my good friend Alina shared a photo of her hollowed out strawberries filled with jello shots- I said 'Hell yes' to this fancy vessel touting shot idea. No longer do need to struggle with getting the liquor -laden jello out of the stiff little plastic cups while nearly slicing open your tongue on the hard edge, nor do we need to look like we are desperate for that teaspoon of alcohol found in each as we try to gracefully smack the back of the cup hoping the jello will magically fall into our mouths. Those days are over my friends! 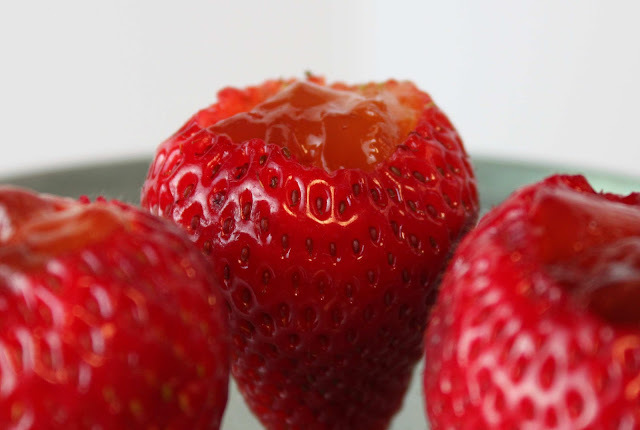 Enter the strawberry cup; a simple strawberry with a hollowed out core, filled with flavored gelatin. All edible. All delicious. All genius. What about the drawbacks? Yes, admittedly there are some. Size comes in to play: if the strawberries are too small, you'll need a hundred of them to use up all the jello mixture. Too big and it's a difficult one-biter. 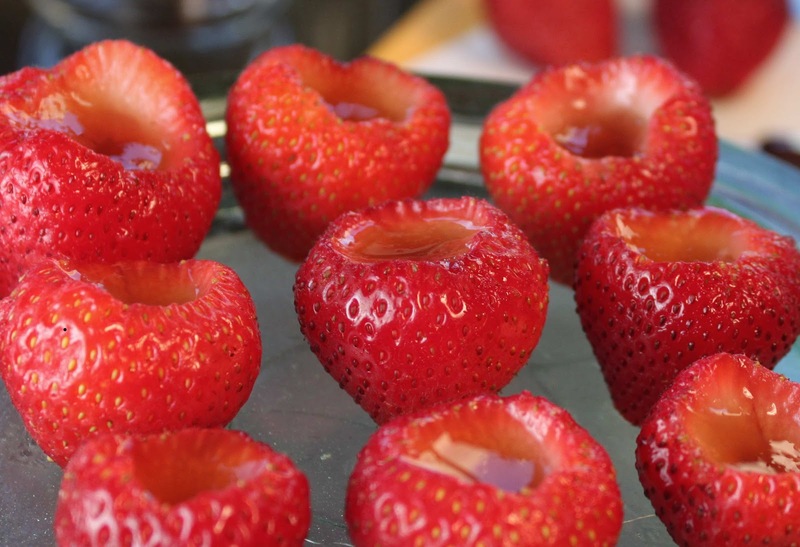 Also strawberries wilt and release their juices if cored too soon, so these need to be made the day of your party. But a jello shot-filled strawberry is a damn fun, novel, conversation-starting gimmick for your next party! Try it the Fat and Happy way, by eating your jello shot! Thanks Alina! Fat and Happy Food Blog Tips and Techniques: Use any jello flavor you think matches a strawberry: try lemon, lime or orange. Search this blog for more Jello shot flavor ideas as well. Heat 1/2 cup water and the sugar until the sugar is dissolved. Sprinkle the gelatin over the the warm sugar water, stir to dissolve. Add in the port and remaining water, stir to combine. There may may be some clumps remaining from the gelatin if it didn't all dissolve- do not fret. Simply strain the mixture, pour into a container to solidify, and place in the fridge for about 3 hours or until set. Wash and core the strawberries, make a small slice at the bottom point of the berry, so it can stand up on its own. Spoon each berry with some of the port jello. Enjoy. Note: I did try to fill the the strawberries first and let the jello shots solidify in the strawberries, but I found it much easier and less messy to just scoop the jello in afterward.